"This is a smear, plain and simple," Brett Kavanaugh says. That's his response to the new allegation of sexual misconduct against him -- published by The New Yorker on Sunday night -- in a story co-bylined by Ronan Farrow and Jane Mayer. 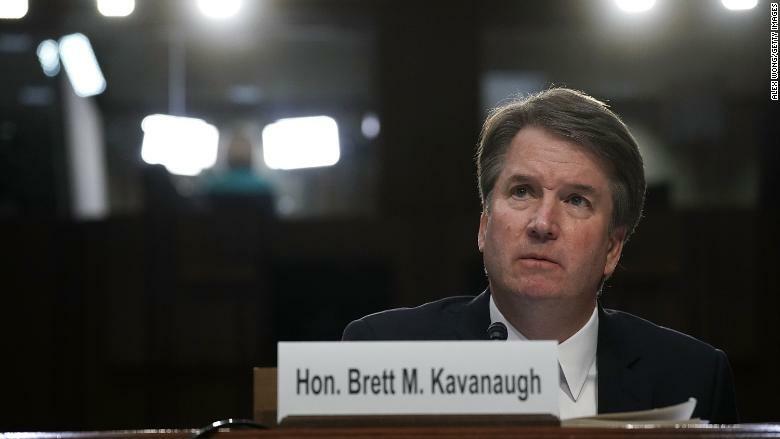 "I look forward to testifying on Thursday about the truth, and defending my good name -- and the reputation for character and integrity I have spent a lifetime building -- against these last-minute allegations," Kavanaugh said. The White House responded to the story by reiterating its support for Kavanaugh. But the headline everyone heard Sunday night/will hear Monday morning is: "A second woman." "New allegations." This time, the rumors were right. All afternoon long, the chattering classes in DC and NYC said that Farrow was about to break a big story about Kavanaugh. The White House apparently knew several hours ahead of time. Word of the story leaked out via The Drudge Report in the 6 p.m. hour. The actual story came out one hour later. But it wasn't just Farrow's story: Mayer was the second byline. This was the third co-production by the pair: They also worked together on the investigation that ensnared NY A.G. Eric Schneiderman. >> FLASHBACK: Mayer and Jill Abramson co-authored "Strange Justice: The Selling of Clarence Thomas..."
As I said on "CNN Newsroom" Sunday night, there's much more to be learned here. But the existence of this new allegation will spur a lot more scrutiny of Kavanaugh's hard-partying high school and college years. Already, there's been reporting about excessive drinking and ensuing behavior. One of the headlines on CNN.com on Sunday night, before this new allegation came out, said "100 kegs. A stripper. Kavanaugh's classmate reveals wild parties..."
During the aforementioned CNN segment, I found myself saying this about Kavanaugh: "He is allowed to have been a frat boy. I'm sure other judges have been frat boys. I'm sure other judges have had similar experiences at college." On CNN, David Gergen urged caution and patience: Lawmakers and the public need time to "absorb this and begin to make judgments." He said, "I can't tell you how important I think it is for the future of the press in this country, if he's going to be 'brought down' -- we don't know that, but if he's going to be 'brought down' -- that the press isn't seen as complicit in that effort." President Trump's tweets casting doubt on Christine Blasey Ford's account helped the hashtag #WhyIDidntReport go viral. The conversations may have also spurred some people to seek support. As mentioned up above, Jane Mayer and Jill Abramson co-wrote the definitive book about Hill and Thomas. As for this moment in time, Abramson told me on "Reliable," "What I've been struck by is the anger of women that I've heard from. If they feel unheard at the end of these hearings, I think there are gonna be big political consequences..."
>> Another key point: Think of "the courage it takes," she said, "in THIS media environment, for Dr. Ford to walk into that hearing room, sit down and tell her story..."
Consider the state of the TV business. CBS CEO Les Moonves resigned under pressure two weeks ago. NBC Entertainment chairman Bob Greenblattis ready to step down. Fox is a big question mark, given the Disney-Fox deal. At at Disney, TV chief Ben Sherwood is "preparing to leave," Variety's Cynthia Littleton scooped on Saturday night. THR notes that "he had a contract with Disney extending until 2021." He'll remain with Disney until the Fox deal closes, then he'll have a noncompete for a while... And then what? Deadline hears that "we are about a week or so away from Disney unveiling the names of top 21st Century Fox executives who would be joining the company following the acquisition of key Fox assets." October 1 is the potential date. Rice's deal is "said to be all but done" and Fox TV Group chairman Dana Walden is "negotiating hers." "Also expected to be going over to Disney-Fox after the acquisition is completed are FX Networks CEO John Landgraf and Nat Geo CEO Courteney Monroe," Deadline says. "The situation is fluid with Fox TV Group chairman Gary Newman..."